Gingerbread Coffee Cake is a recipe made in heaven. 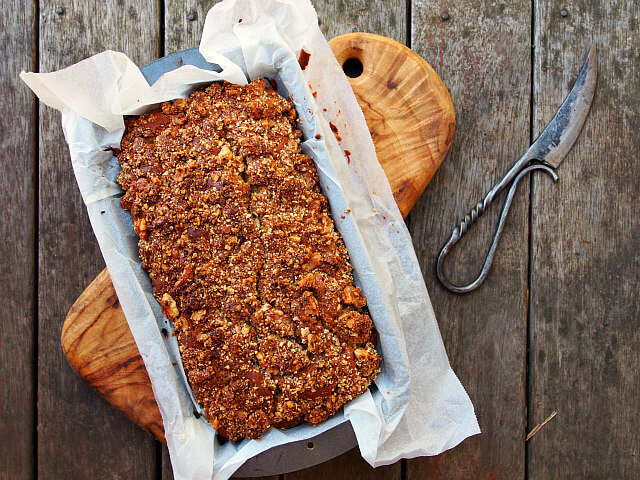 With the tender, buttery crumb of coffee cake paired with fragrant ginger and strong molasses, it is made better only by the addition of a nutty streusel topping rich with butter and brown sugar. While coffee cake is generally served with a big pot of coffee, this spiced coffee cake is even better served with hot cups of our Gingerbread Chai Tea. With the cake baking and the tea brewing, your kitchen will be an aromatic haven that will chase away the blues on dark autumn days. Gingerbread is a dark, dense piece of deliciousness, so when you’re making a gingerbread coffee cake, it’s vital to include the ingredients that will give the cake that unmistakable gingerbread feel. I like to use a mix of whole wheat and white flours in the batter. The whole wheat gives a wonderful earthiness, while the white flour ensures the cake retains the lightness of a coffee cake. Blackstrap molasses is another necessity; without it, the gingerbread coffee cake will be pale and insipid. Drizzling in a generous spoonful or three will give the cake a beautiful dark brown color plus a distinctive richness that, when tasted, will conjure up happy memories of gingerbread men with lopsided grins piped on in white icing. Ginger is the third ingredient that a gingerbread coffee cake cannot do without. I like to double the gingery impact by sifting in a generous tablespoon of ground ginger, as well as a hearty handful of candied ginger, chopped finely so that with each bite of cake you’ll get a little explosion of sweet, gingery goodness. If you really love ginger, you could also grate about an inch of fresh ginger and stir it into the wet ingredients before mixing the batter together. 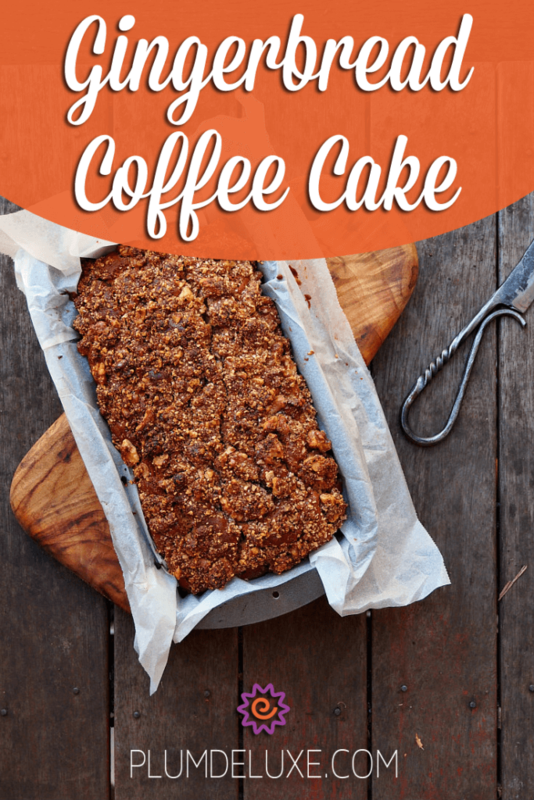 For me, coffee cake of any variety just wouldn’t be coffee cake without a scrumptious streusel topping. While you can make a quick one with flour, butter, and sugar, I like to ramp up the deliciousness by making a streusel with butter, dark brown sugar, ground ginger, and coarsely chopped walnuts or pecans. You can scatter the streusel over the top of the cake, or make it even more special by spreading half the batter in the pan, sprinkling streusel over it, then topping with the remaining batter, and even more streusel to finish it off. 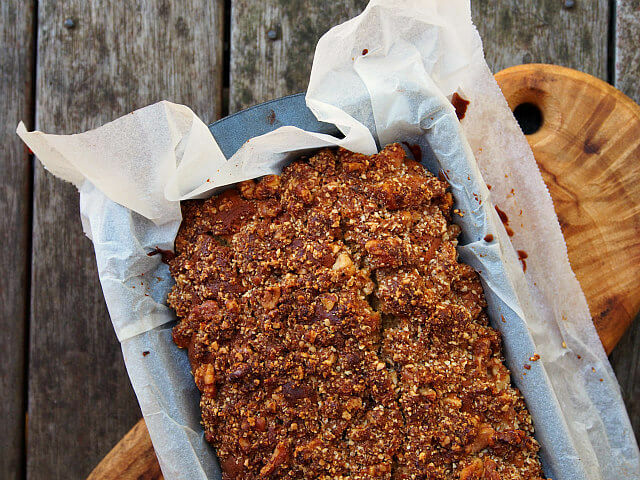 There’s something downright heavenly about biting into a piece of coffee cake and getting multiple layers of flavor and texture, from the tender, buttery crumb, to the tiny pieces of candied ginger, and finally the crunchy, nutty, lightly toasted streusel. Yep, that’s a gingerbread coffee cake I will never turn down. When it’s time to serve your gingerbread coffee cake, warm or room temperature is ideal. Cut generous slabs of cake and serve them with a dish of salted butter, a bowl mounded high with real whipped cream, or, if you’re feeling especially decadent, vanilla ice cream. In large bowl, beat together butter, brown sugar, eggs, sour cream, and molasses. Set aside. In medium bowl, stir together flours, ground ginger, candied ginger, baking powder, baking soda, and sea salt. Add dry mixture to wet, stirring well until incorporated. Set aside. Mix together topping ingredients. Set aside. Line 9 x 9-inch metal pan with baking paper. Pour half batter into pan and smooth into corners. Sprinkle half of topping evenly over batter. Spread remaining batter and top with remaining topping. Place coffeecake in oven and bake for 35-40 minutes until toothpick inserted into center comes out clean. Serve coffeecake warm as is or with softened, salted butter.